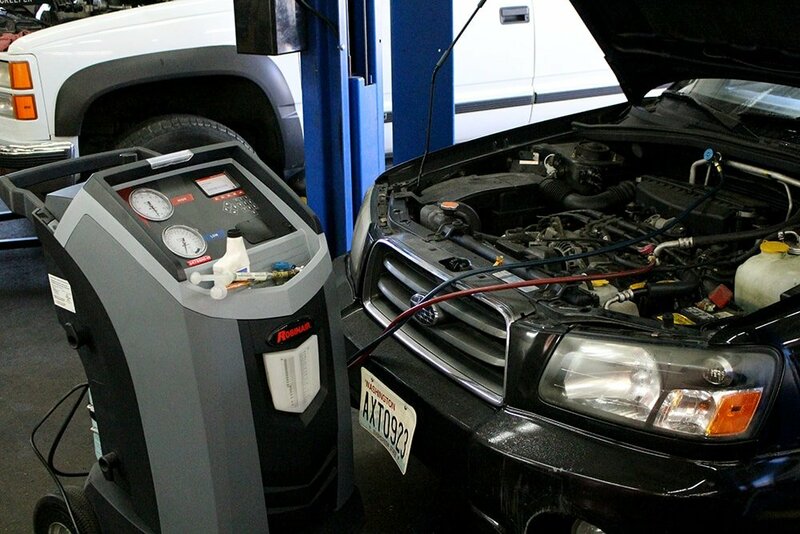 We provide high quality Kent Auto Air Conditioning repair at Lloyd’s Auto Clinic. We have numerous years of experience in the Auto Air Conditioning repair business and all of our automotive technicians are ASE certified. We offer guaranteed workmanship and affordable prices. Regular maintenance is the best way to keep your Air Conditioning system working properly. If not serviced regularly, the hoses and pipes in your Air Conditioning system might clog, which can result in reduced cooling capability and efficiency and therefore require repair. Low airflow even on the highest fan settings. The Auto Air Conditioning system is blowing warm air. The Auto Air Conditioning system quits blowing whenever the auto is stationary and doesn’t function when idling and only functions when driving. The Auto Air Conditioning system is blowing air that smells like mold and mildew and is musty and damp. The Auto Air Conditioning system only blows air that is slightly cooler than the exterior air. A measurement of the interior vent air temperature. Verification that the A/C pressure meets the specifications provided by the Auto Air Conditioning manufacturer. A pressure test of the Auto Cooling System. An inspection of the Auto Air Conditioning system for damage of seals or leaks. An inspection of the compressor belt. A check of the thermostat, radiator cap pressure, hoses, and radiator coolant operating temperature. An examination of the blower and internal controls. The evaporator, which is intended to remove the heat from the inside of your auto. It is actually a heat exchanger and is critical not only to your comfort but also to the Air Conditioning system. This evaporator permits the refrigerant to absorb heat, which causes it to boil and be converted into a vapor. Whenever this occurs, the compressor removes this vapor from the evaporator, which reduces the humidity and also cools your auto. The evaporator is most susceptible to corrosion caused by harmful Air Conditioning acids since it houses the majority of the refrigerant during this process of heat transfer. Typically, the result is damage to the evaporator that is so severe that it isn’t repairable. This is only one of the reasons that you need to see us in order to prevent this from happening. The expansion or orifice tube is a mechanism that regulates and controls the flow of refrigerant in the entire Air Conditioning system. Additionally, it also allows the refrigerant to enter the evaporator by converting the high pressure liquid refrigerant from the condenser into a low pressure liquid. Although this expansion tube is usually located at the inlet to the evaporator, it might also be found at the outlet of the condenser or between the evaporator and the condenser. The receiver is a metal container that stores the refrigerant. It is also known as the drier since it filters out harmful Air Conditioning acids as well as debris particles that might otherwise cause damage to your Auto Air Conditioning system and absorbs moisture from the refrigerant. The drier should be changed between three and four years to prevent any damage that might be caused by these detrimental chemicals and to make sure of quality filtration. The drier can usually be found located on the liquid line of the Auto Air Conditioning system. The primary function of the condenser is to cool the refrigerant. This heat dissipating mechanism radiates the heat that is released by the compressed gases and condenses them into liquids under high pressure. Although usually located directly in front of the cooling radiator for the engine in the front of the auto, the location of your condenser depends on how new your auto is. The belt driven device that compresses the refrigerant gas and then transfers it to the condenser is known as the compressor. This compressor is the heart of your Air Conditioning system on your auto, although it basically acts as a simple pump.